While the Department of Education provides meals on summer school campuses, other efforts are afoot to deliver food to nonschool venues. 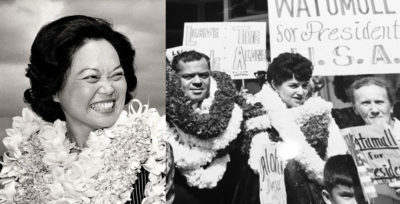 On a recent Friday morning, a white shuttle van departed Kapiolani Community College carrying 600 meals of chicken adobo, hapa rice, green beans and peaches. The vehicle was bound for four sites across central Oahu: YMCA of Honolulu at Central Middle School, YMCA Nuuanu, YMCA Kalihi and Kuhio Park Terrace, an affordable housing complex. The circuit took 90 minutes, accounting for the unloading and delivery of meals at each site in time to feed scores of kids who are out of school for the summer before the food gets cold. Justin Ng loads meals prepared at Kapiolani Community College’s Culinary Arts department into a van bound for various YMCAs around Honolulu. 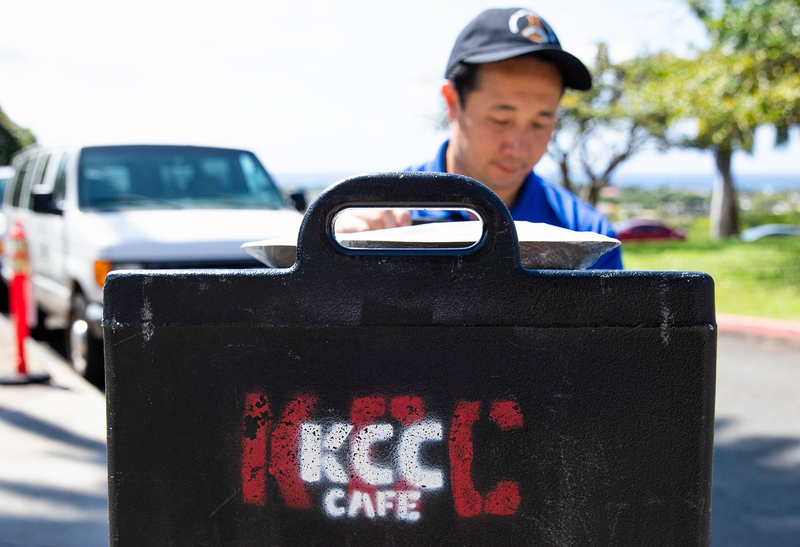 “We’ve got it down to an art now,” said Daniel Leung, the program coordinator for KCC’s Culinary Arts Department, now in its third year of operating a summer mobile lunch service for children in central Oahu. 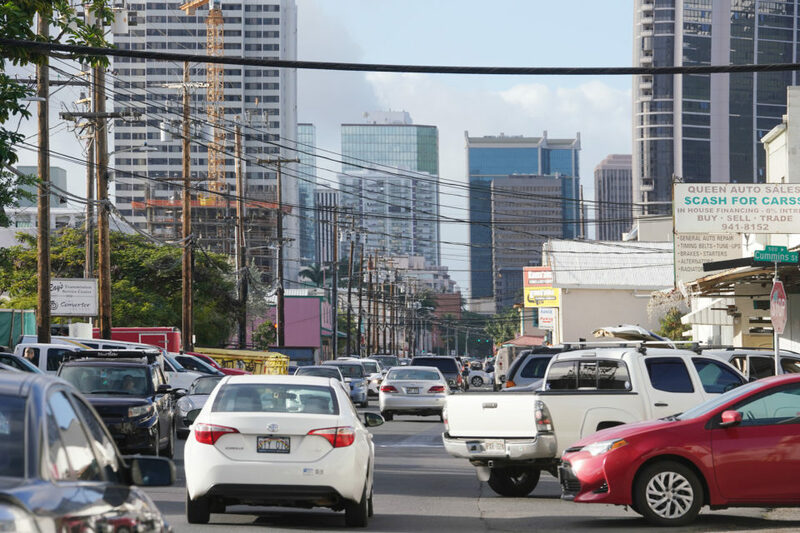 For Hawaii’s youths, summer means a welcome break from the classroom and homework assignments. But it’s also a potential interruption in the stream of free or subsidized breakfasts and lunches that many receive during the school year. Although about 61,000 Hawaii students participated in the National School Lunch Program in the 2016-17 school year, only 5,800 received a summer meal in July 2017, according to a study released Wednesday by the Food Research & Action Center. That’s fewer than one in 10 eligible students reached in the summer, which places Hawaii toward the bottom of states nationwide — 41st — when it comes to feeding summer meals to kids. 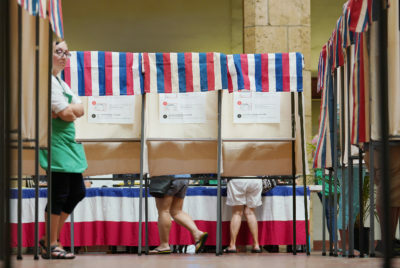 It’s harder to feed them during the summer because they aren’t already clustered in one place and staffing is low, according to Nicole Woo, senior policy analyst for the Hawaii Appleseed Center for Law & Economic Justice. 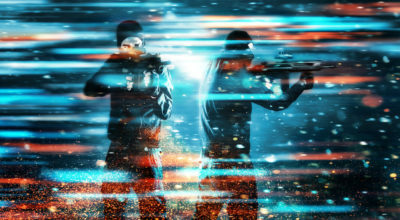 “It’s a much more complicated program that takes a lot more coordination and community partnerships,” she said. 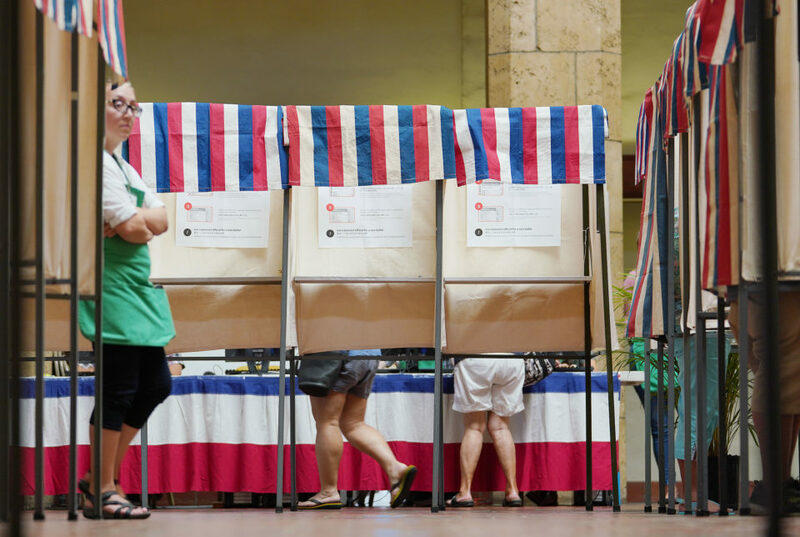 But Hawaii is slowly making progress through the expansion of KCC’s mobile food delivery service and the involvement of Lanakila Kitchen, an arm of nonprofit Lanakila Pacific that does its own mobile meals service for kids. 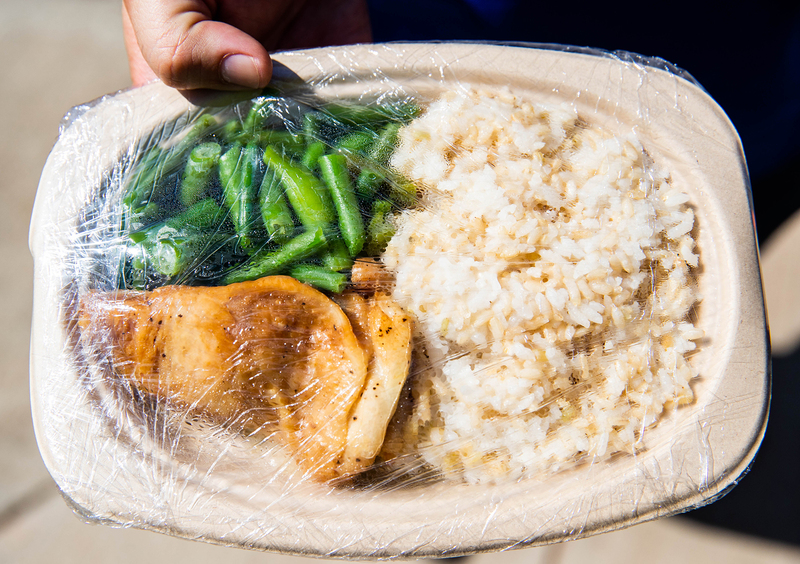 A KCC-prepared lunch delivered to kids on a recent Friday included adobo chicken, hapa rice and green beans. Meals must meet federal nutrition guidelines. 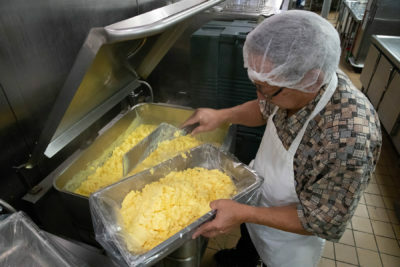 The Hawaii Department of Education separately administers the Seamless Summer Food Program — an extension of the National School Lunch Program — at 68 schools. The only criteria for federal reimbursement is that at least half of that school’s regular student body qualifies for free or reduced lunch and that the campus offers a summer program. 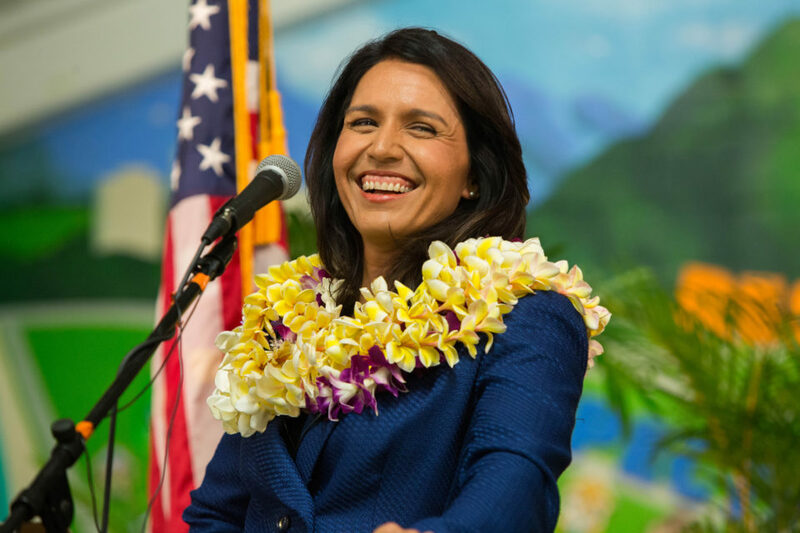 “The summer meal program is an extension of what schools are serving for breakfast or lunch: cereal, breakfast, pizza,” said Jennifer Dang, acting assistant director of the DOE’s Hawaii Child Nutrition Programs. 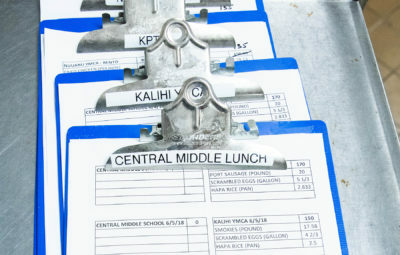 Clipboards indicate where KCC staff will be delivering summer meals to students around central Oahu. While the DOE has introduced breadfruit, local beef and papaya into pilot schools during the regular school year through its Farm to School initiative, the locally focused approach hasn’t been included in summer menus yet, Dang said. Nonprofits and other sponsors providing summer meals — such as KCC — also get federal reimbursement through the Summer Food Service Program. These community partners also follow federal nutrition guidelines and get a slightly higher federal reimbursement than schools — $4.59 per meal. They tend to emphasize local or fresh ingredients. Meals are served to kids at venues such as affordable housing complexes, YMCAs and canoe clubs. The efforts seem to be paying off: More children are accessing the Summer Food Service Program, statistics show. Average daily participation grew from 1,600 in July 2016 to 1,840 in July 2017, a jump of 15 percent and the third-highest increase in the country, according to FRAC’s latest report. The DOE also saw a slight increase in summer meals served from 2016 to 2017. In 2017, schools reached 6,943 kids through summer meals while community partners reached 6,671, according to numbers provided by Hawaii Child Nutrition Programs. 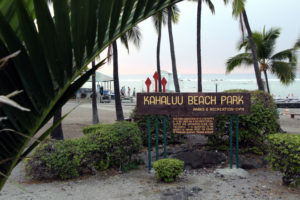 On the west side of the Big Island, Kona Pacific Public Charter School spearheaded the first-ever summer mobile food delivery service in Hawaii in 2015. The school leases a nearby church kitchen to prepare summer meals — a sandwich or wrap typically — that reflect the charter school’s ethos during the regular school year of scratch cooking that cuts out refined sugar and flour. 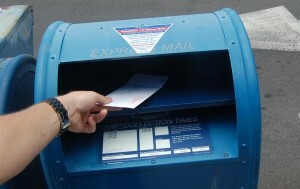 From June 4 to July 27, the school will deliver meals to various housing complexes and canoe clubs around Kona. 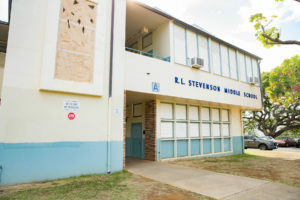 The Big Island’s size and sparse population centers means kids have less access to meals through the DOE’s summer school sites. Volunteers serve kids meals at Mayor Wright Homes Family Literacy Library in Summer 2017. 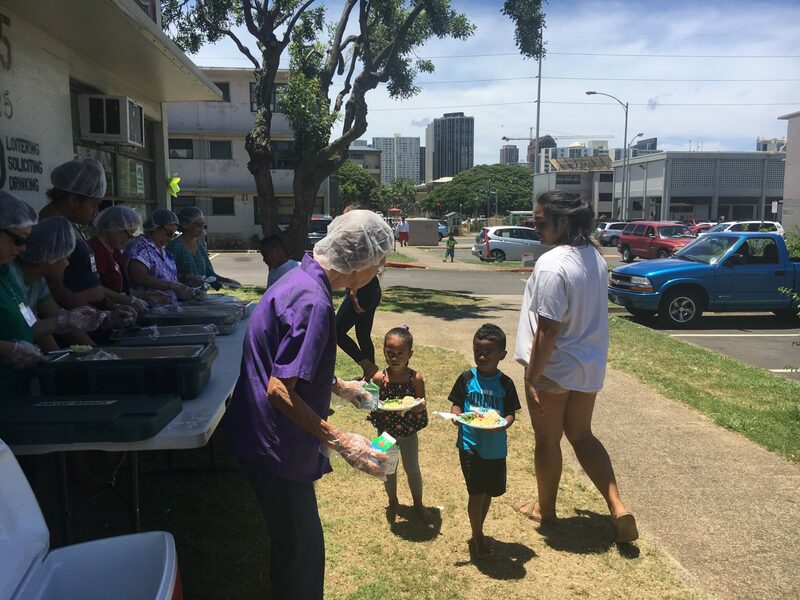 On Oahu, KCC’s mobile summer meal service has made a big impact on kids and their level of learning, according to Suzanne Skjold, executive director of Hawaii Literacy, which runs programs at places like Mayor Wright Homes, a public housing complex in Kalihi. KCC has also begun serving summer breakfast to one site. 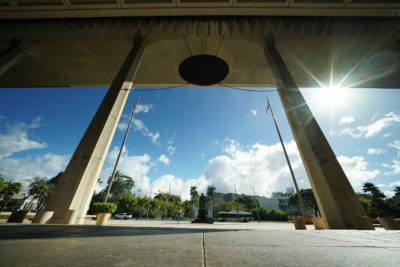 KCC’s menu this year includes items like island style beef stew, teriyaki chicken and roast pork — food the college serves to its own students on its Diamond Head campus. Serving summer meals helps combat what’s known as the “summer slide” — the learning loss that occurs when students are out of school for a long stretch of time. Studies show this learning loss disproportionately affects low-income students, widening the achievement gap. Kids congregating over a summer meal — whether at a school or a community center — are in an interactive environment that helps them, according to Woo of the Appleseed Center. “It doesn’t have to be academic programming to help slow down that summer slide, but almost any enrichment activity: parks or recreation, a cultural activity, anything that keeps them engaged and stimulated,” she said.